Wigeon are always a welcome surprise. 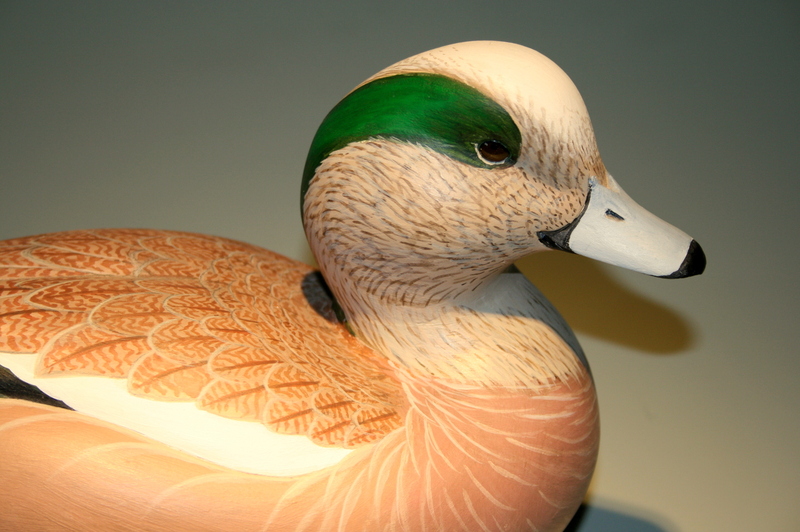 We do not have a lot on Long Island or here in dairy country, but you always know Wigeon when you first spot them. The puffy head, pointed wings and tail, white coverts and belly – easy to know even if you do not hear their wheezing “rubber ducky” calls. 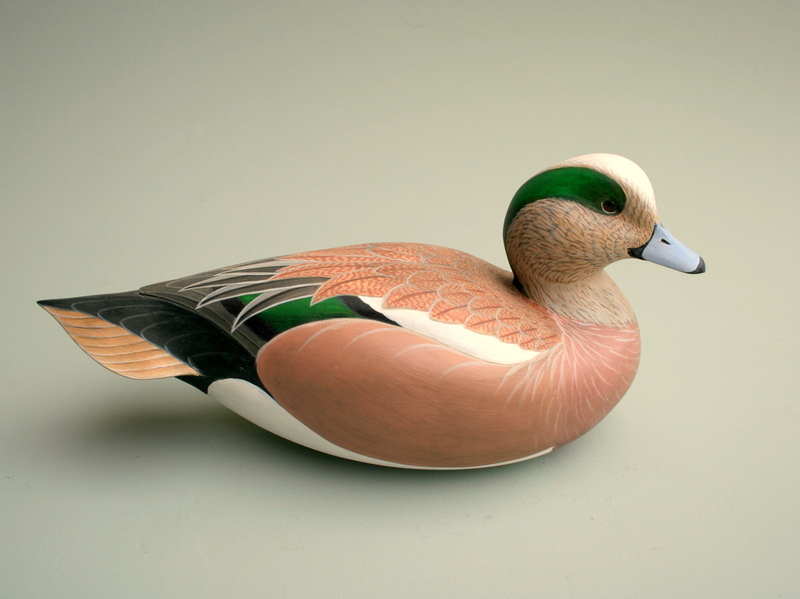 They are an elegant bird – perhaps surpassed only by the Pintail – and a pleasure to replicate in wood. This bird was a gift for a partner’s Fiftieth. That was a while ago now – and I am always happy when I see a bird that has stood the test of time. The feathers on the face are marked like no other – they require a different approach than that used on Black Ducks or hen puddlers. 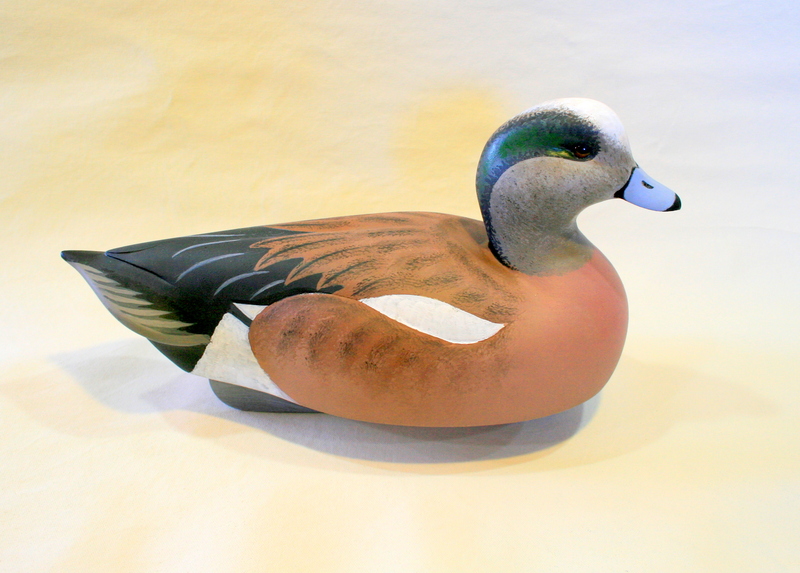 And, like the Drake Pintail, his “herringbone tweed” cape is fun to paint. The difference between this gunner and the mantelpiece Wigeon is probably about 20 hours – all of it in the paint on the decorative bird. Although the “building” of a gunning decoy involves some additional work in the keel – sawing it out, boring the hole for the anchor line, softening all of its edges, and especially pouring just the right amount of molten lead into just the right size mortise – the painting is much quicker. Both are carved with equal care and sanded thoroughly, then sealed and primed. But, a gunning paint job by definition is one that should be accomplished quickly – as if you had to complete a dozen or two at one sitting. The trick is to get the same effect as the fancy bird – at about 10 yards. Painting decoratives is work, but painting gunners is just plain fun.